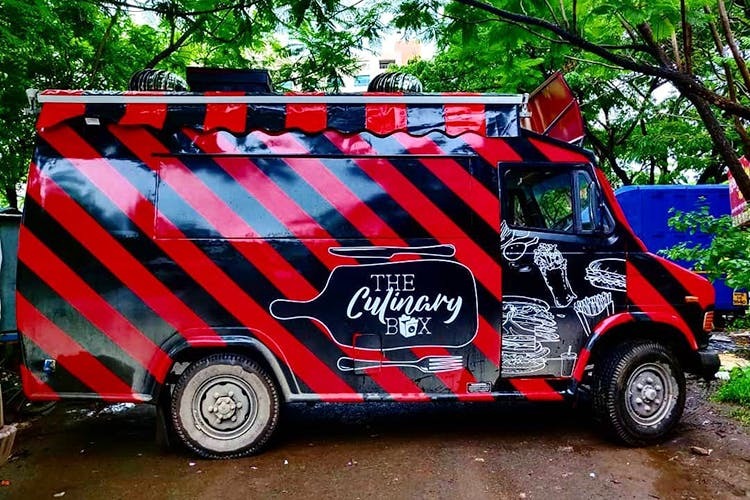 Situated at the Hinjewadi Khao Galli, close to the Symbiosis Infotech Campus, The Culinary Box is the newest red-and-black food truck in town and we cannot get over their handmade burgers and cold brew coffee. At The Culinary Box, you can have a full-fledged meal under INR 250. While their scrumptious handmade burgers start at INR 145, the brown bread sandwiches served with a side of fries come for INR 110. We recommend you try their lemon chilly and barbecue fries along with TCB butter chicken burger tossed in makhni gravy. If you're not a burger person, go for either a dynamite paneer or spicy chicken wraps. Don't forget to wash down all these awesome food with their zesty lemon mojito or cold 'brewtiful' coffee. While TCB's cold beverages are great, we wish there are some options for hot beverages too. The Culinary Box operates everyday, between 4.00 pm and 11.00 pm. But we recommend you go there by 10.00 pm, before all the good things on the menu get sold out.